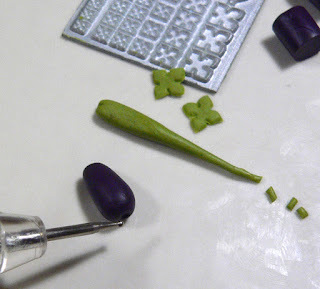 Quiet doesn't mean that I'm not cooking up something... for the last few days I have been playing with some stunning new polymer clay cutters that Peter from Everpace Supplies sent all the way from Hong Kong. 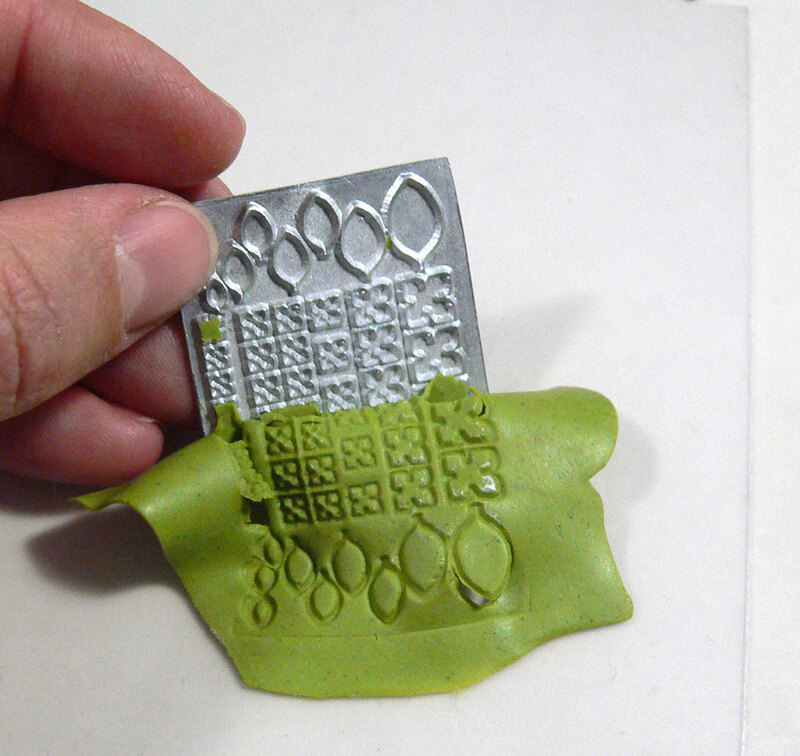 There are very few molds and cutters for clay available that are truly small enough for 1:12 dolls house scale. These fit the scale perfectly, and once one gets the hang of working with them, they are pure pleasure. I'm in love! 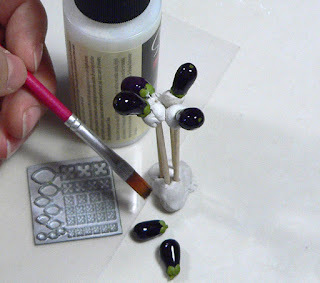 So, here I am offering the fruits of my labour, my very first polymer clay tutorial ever! Enjoy. If you would like to download the tutorial, you will find the PDF HERE. 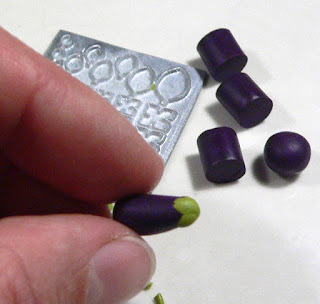 You will need only two colours of polymer clay to make brinjals. A bit of green. Not too bright, with a yellowish cast. I mixed Sculpey Olive green with a bit of yellow and translucent clay to get the colour that I’m using here. Purple. This should be very dark, almost black. I mixed equal portions of Premo Fuchsia and black. Brinjals come in many colours. You can use your imagination, or pay a visit to the greengrocer. Roll out the green clay until it is paper thin. Brush generously on both sides with baby powder or corn starch. 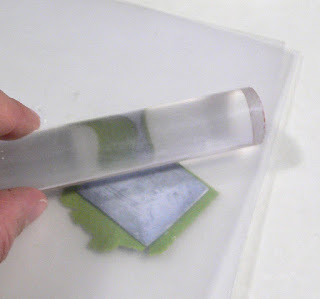 This will prevent the leaves from sticking to the cutter and distorting. (If you don’t have a clay cutter that will cut a very tiny star or flower, you can cut the shapes by hand. Roll a tiny ball of clay, flatten it with your finger and shape with a blade or toothpick). Place the clay on a sheet of plastic or wax paper. 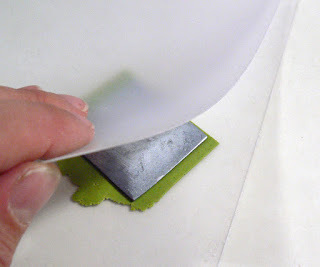 Place the cutter over the clay face down, and cover with another sheet of plastic or wax paper. Gently but firmly use a roller to impress the cutter into the clay. Carefully pull the clay away from the cutter. For my brinjal calyx I’m going to use the largest of the four petal flowers. Roll a log of clay approximately 8mm (3/8 of an inch) thick and cut into segments. Each segment will become a brinjal. There is no fixed size for brinjals, in nature they come in all shapes and sizes. I like my dolls house food to be young and tender when picked, so my fruits are approximately 15mm (1/2 an inch) long. If your dolls house gardener is going to enter his prize brinjal in the regional agricultural show, you can make them a little bit bigger. Here comes a bit of important realism. 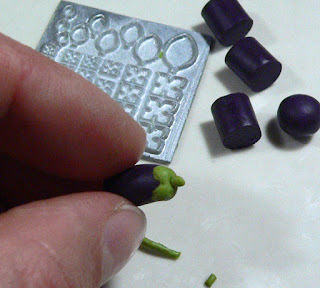 On the fat side of the brinjal, make a shallow indentation with a ball tool. This is the blossom end of the fruit. 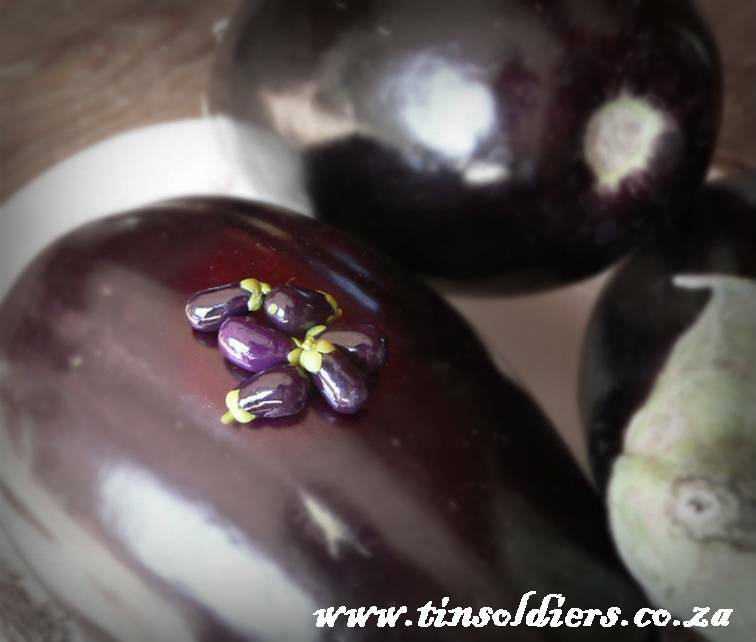 And a bit of trivia: Did you know that brinjals are of the same family as deadly nightshade and potatoes? Technically a brinjal is a berry. 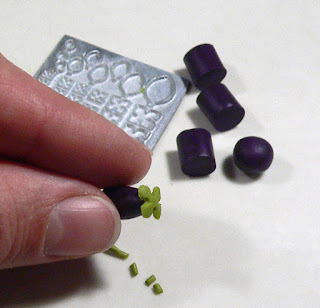 Push a tiny scrap of green clay into the blossom end of the brinjal with a toothpick, and scratch and blend the green to the sides of the indentation so that it looks uneven. 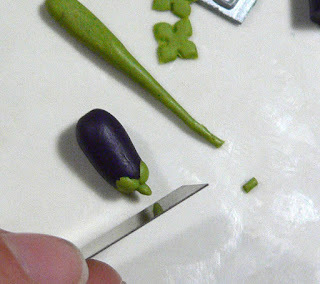 Press a green flower shape over the narrow end of the brinjal. This forms the calyx. Press down with your fingers until the petals start melding together and lie tightly against the body of the fruit. 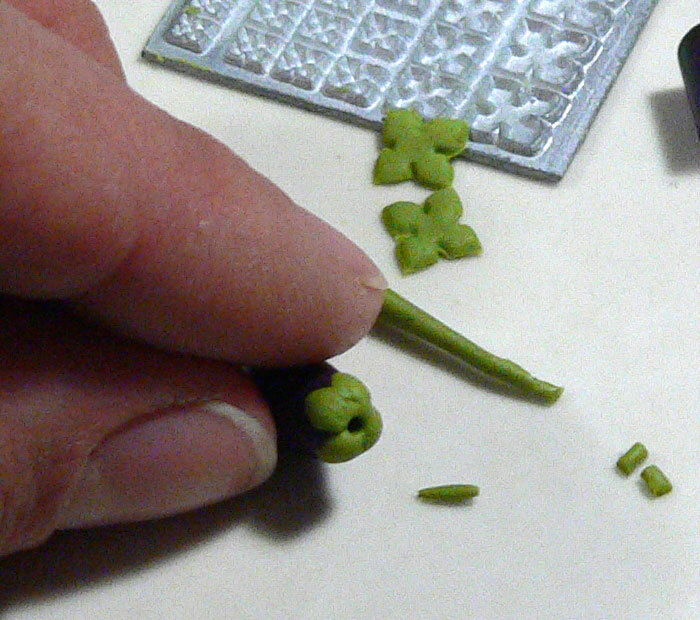 Use a ball tool or toothpick to make a small hole in the center of the calyx. Roll a thin log of green clay to make the stem. Make one end of the log pointy. Press the pointy end of the stem into the prepared hole, and use a toothpick to blend the clay around the base of the stem so that it is securely attached. Use a sharp blade to cut the end off the stem, it must look as though it was picked off the plant with secateurs. 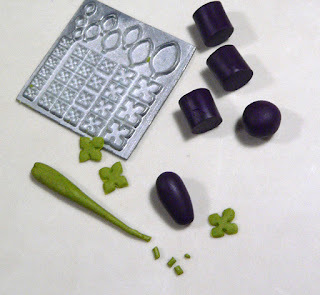 Bake your completed brinjals according to the clay manufacturer’s instructions. 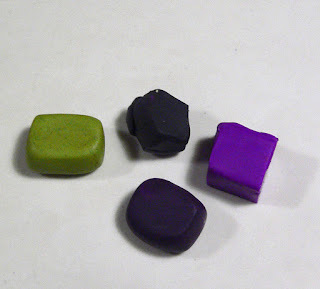 (Most polymer clay bakes at 130˚ C for about half an hour). 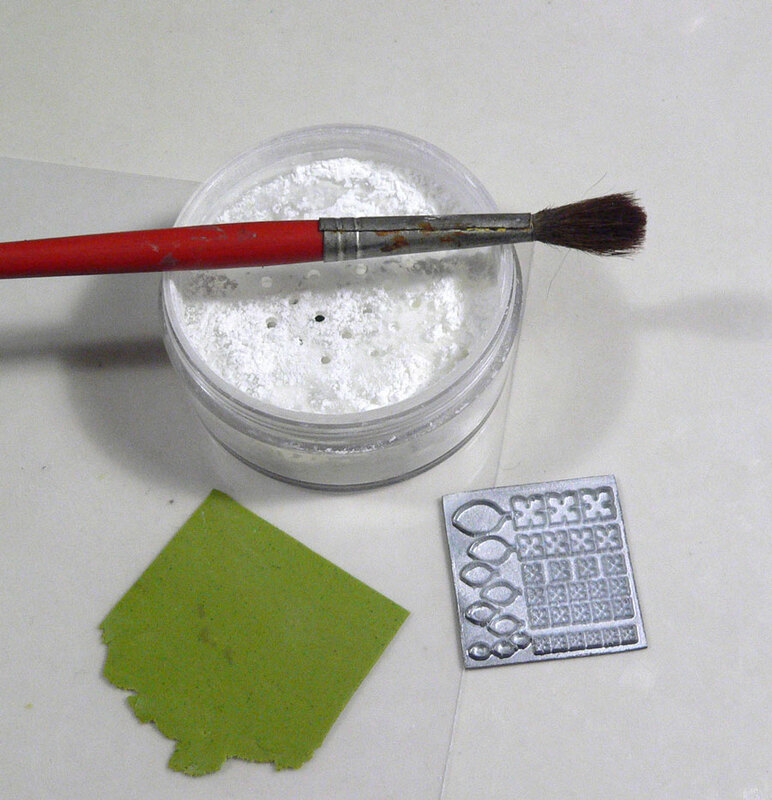 Finally, when the clay has cooled, paint with a gloss varnish that is intended for use with polymer clay. It is important to paint only the purple part of the fruit, the green bits of a brinjal have a matte appearance. 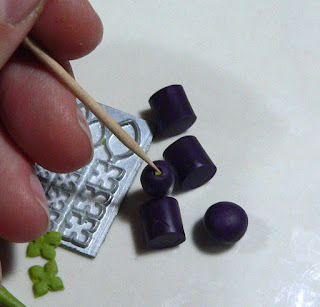 I use toothpicks and prestik (blu-tack) to hold the brinjals while the varnish is drying. 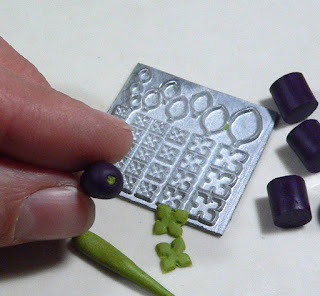 The real brinjals in this picture came from a fellow miniaturist’s garden. Thank you Rinda, they were eaten with lots of garlic and olive oil shortly after I took the picture. Just delicious! This is a lovely blog! Now I am your follower. Thank you for your kind words about my blog. I will try to keep it interesting for you! Glad you like it! Happy New Year, and may we all find lots of time to be creative in 2013. Thank you! Have been too busy to work with clay much lately, but am working on a clay noses and claws tutorial right now.